Our new Engine and Hydraulics Kit offers mobile repair technicians a single solution to diagnose the majority of systems on all mobile plant machinery, including tractors, back-hoe loaders, combine harvesters, and telehandlers. With this kit, the technician can diagnose problems across the engine / hydraulic system boundary by directly relating engine characteristics to the performance of the hydraulic system and vice versa. Watch the overview video or read more about the kit. The TA330 is a BNC lead with a detector that enables a technician to detect the presence of the keyless entry carrier frequency in the range 125 to 140 kHz (as used by most manufacturers). The device has a short range by design, allowing the technician to check each pick-up coil in turn and hence identify a faulty unit. The detector does not decode the high-frequency secure information used to unlock the vehicle. The keyless signal detector is available here. This BNC lead with a detector enables a technician to prove the correct operation of each of the ultrasonic parking sensors in turn. By directly showing the strength of the signal from a given sensor, it can also be used to identify problems with the masking of sensors due to the fitment of aftermarket accessories such as tow bars or lights. The parking sensor detector is available here. The new Sight block kit is designed to investigate low-pressure fuel systems (as used in our Volkswagen caddy case study). It contains the Sight block, a stop valve for testing a negative pressure fuel pump under load, and 3 sets of hose barbs for connecting to different size fuel hoses. The Sight block kit is available here. Add diesel compression testing to your list of uses with the new glow plug adaptor kit. It contains 15 different glow plug adaptors and the adaptor that connects them to our standard compression hose (TA212 not supplied). This covers the majority of commonly used glow plug styles in modern diesel engines. The Glow plug adaptor kit is available here. This set contains 11 sets of 6 different sized universal breakout leads and a set of 6 back pinning probes. The individual breakout leads are designed with the ability to clip together into a single block for ease of handling. You can find more information and purchase the set here. The Master Kit is available on our product kits page. The WPS500X Adaptor kit B lets you use your WPS500X as a replacement for the gauge in a wide range of compatible pressure test kits. This kit lets you reuse your existing adaptors and still gain the advantages of seeing pressure activity in real time with the WPS500X. The Pico WPS500X Adaptor Kit A lets you use your WPS500X as a replacement for the gauge in a wide range of AST pressure testing kits. This kit enables you to reuse your existing adaptors, and still gain the advantages of seeing pressure activity in real time with the WPS500X. The Coil-on-plug (COP) and signal probe from Pico Technology is the fastest way to check coil-on-plug ignition coils and spark plugs. Like distributors, spark plug wires (HT leads) are starting to disappear from cars. With the new COP ignition systems, the ignition coils are connected directly to the spark plugs, eliminating the need for the spark plug wires. With no high-voltage spark wires, you need a COP probe to pick up the secondary ignition waveform. Pico Technology has launched the next generation of Automotive PicoScopes with a host of exciting features. We have again managed to massively improve the performance but keep the same price. The new scopes are available as 2-channel (PicoScope 4225) and 4-channel (PicoScope 4425) options, and are supported by a complete range of kits to give workshops the chance to make money from their PicoScope, right out of the box. Faster sampling at up to 400 million samples per second, with a 250 million sample memory, means that nothing can escape the PicoScope. The PicoScope 4425 boasts an input voltage at ±200 V, to handle increasing injector voltages without the need for attenuators. They are all captured in 12-bit resolution (16-bit in enhanced mode), with ±1% accuracy. For more information, or to order your PicoScope online today please visit the Automotive PicoScopes section of our website. 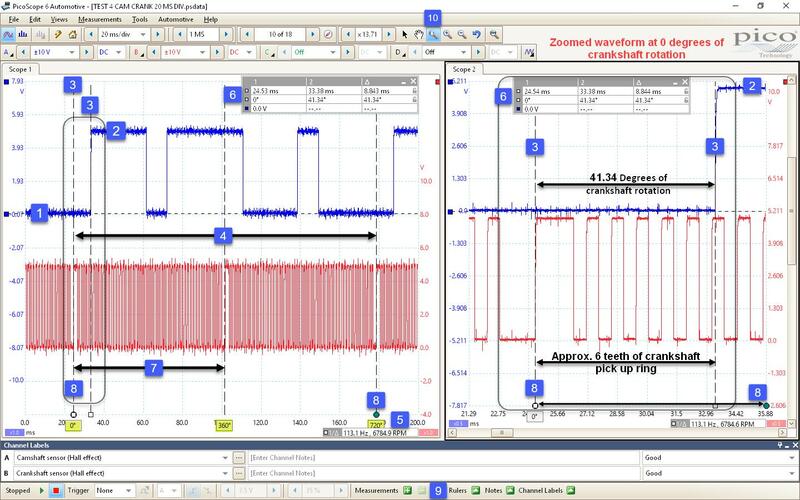 The PicoDiagnostics NVH Kit makes use of the PicoScope 4000 Series Automotive oscilloscope to provide a cost-effective answer to the many NVH problems facing technicians today. Providing real-time diagnosis to the technician in the form of either: a bar graph, a frequency chart, a 3D frequency chart, RPM order or road speed view. The ability to start the recording before a road test, and play back the recording for analysis on your return, ensures that driver attention remains on the road. Saving the recordings couldn’t be simpler: much like our other automotive software you simply save the file to your laptop’s hard drive. Pico Technology has been named number 55 of the 100 Best Small Companies to work for in the UK at a prestigious award ceremony hosted by the Sunday Times newspaper. This sought-after award measures and acknowledges excellence in workplace engagement - where only organizations with the highest level of overall employee engagement qualified. The results of this survey are based on what our employees say about the organization plus how we manage, motivate and reward our workforce. A UK tour across 20 different venues, covering England, Ireland, Scotland and Wales. The vehicle in question belongs to a staff member here at the Pico Head Office. The driver informed us that that EML (Engine Management Light) had come on but that there was no loss of power, and no sign of anything wrong, apart from the light coming on. 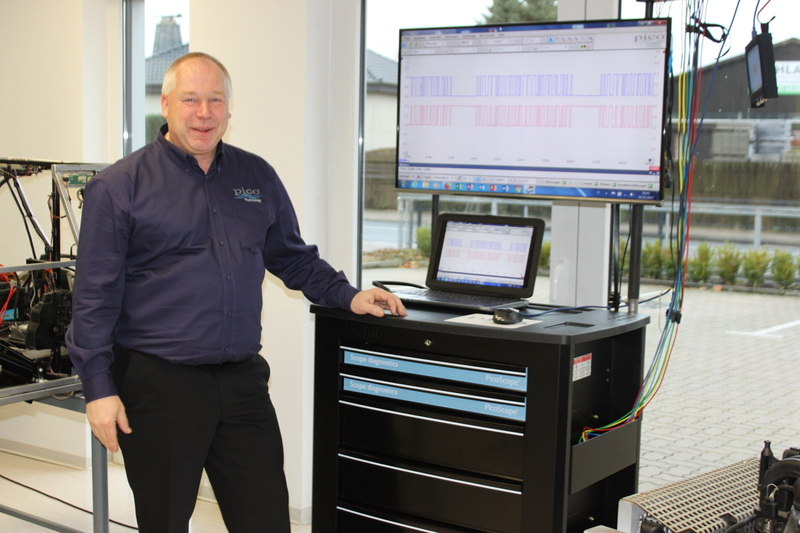 Pico Technology Automotive opens office in Hannover, Germany. To improve the service we can offer to our aftermarket and vehicle manufacturer customers in Germany, Austria, and Switzerland, we have opened a Pico Technology GmbH Automotive office in Germany where Olaf Jensen has joined us as the Automotive Distribution Manager DACH. The Pico Technology GmbH office is located at the Sternbeck Akademie in Garbsen near Hannover, where we also have access to a fully operational workshop business and excellent training facilities. "My 1996 Rover 100 helped me get to grips with NVH. Being pre-OBDII, it's not possible to take a live RPM feed from the diagnostics socket. However, the Pico optical pickup gives a perfect RPM signal using the crankshaft pulley, but I have to place it under the offside wheel arch, which is not ideal, especially if road testing. After a minor modification of a passive filter circuit found on the internet, it was possible to derive a stable RPM signal from the low-tension side of the coil to feed into Channel D on the PicoScope. Everything was then in place to start running the NVH diagnostics…"
This month we have updated our Camshaft - Hall Effect Guided Test. The purpose of this test is to evaluate the operation of a Hall effect camshaft position (CMP) sensor with the engine at idle speed. See the updated test here. In addition to creating new Guided Tests, we are also constantly working to update and improve the ones we already have. This month we have updated our Crankshaft position sensor – hall effect test. Read the Guided Test here. It goes without saying that Hybrids and electric vehicles (EVs) should be treated with caution when it comes to service, repair and of course, diagnostics.​ Here is one such case where a Toyota Auris hybrid arrived with the Hybrid Warning Light illuminated. In addition to creating new Guided Tests, we are also constantly working to update and improve the ones we already have. This month we have updated our Alternator diode/ripple tests. The purpose of this test is to evaluate the cylinder efficiency of a petrol engine throughout 720 degrees of the crankshaft rotation at idle speed. TA213 to TA220 Standard compression hose spark plug adaptors (select the appropriate adaptor for the vehicle under test). 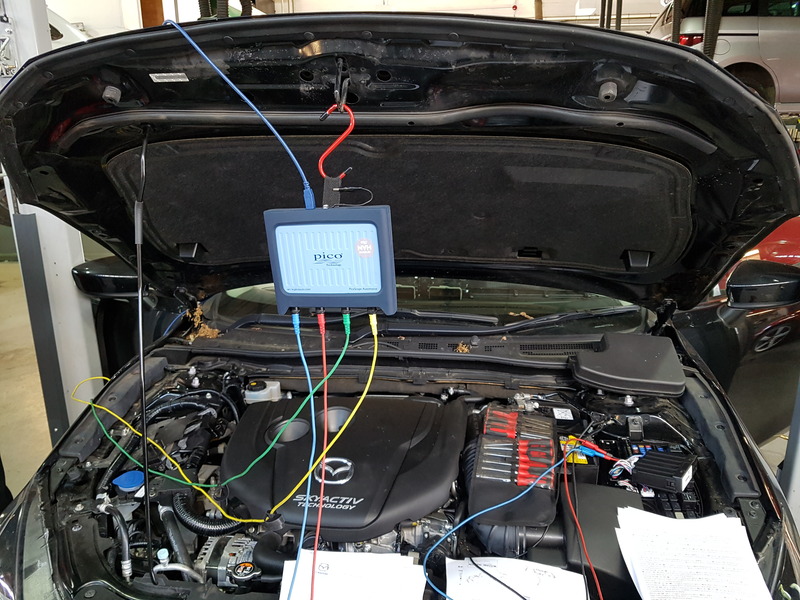 Steve Smith has created a new case study showing his diagnosis of a faulty wiring harness causing the vehicle to overheat. Join him on his journey through the diagnostic process. already have one, are unsure how to use one, or even if you’re an expert with years of PicoScope experience, this group has been set up for you. The group will work in tandem with Pico’s automotive support forum, which uses the same credentials as the hugely popular Waveform Library. This month we want to share a new Guided Test by Pico's very own Ben Martins. The purpose of this test is to verify the integrity of the high-pressure transfer pump or feed pump, internal leaks on the high-pressure side, fuel filter blockage, pipes and hoses for leaks, injector leaks and any aeration within the fuel system.